Is your medicine cabinet starting to look like a pharmacy? Do you really need that bottle of ibuprofen that expired in the 1990s? It’s probably time you cleaned out your medicine cabinet. Stockpiling old or unused medications can lead to medication errors, unintentional ingestion by kids or pets and for some prescription drugs—abuse. So what is the best way to clean out your medicine cabinet? A much debated topic of discussion: whether or not to flush medications down the toilet or throw them in the trash. There has been evidence of trace amounts of medicinal chemicals, such as hormones and antibiotics, found in our nation’s water supply and environment. While both methods of disposal do contribute to this issue, it has been shown that most traces of medicinal chemicals in the environment stem from the body’s normal process for breaking down medications and excreting them through urine and feces. It may be appropriate to throw medications out in the trash. It is suggested that liquid medications, capsules, and tablets be placed in a water tight container or a bag mixed with coffee grounds or kitty litter prior to disposal in the garbage (to make it unpalatable to humans and animals). For certain medications (mainly prescription opiods), the old fashioned method of flushing medicines down the toilet may still be recommended. 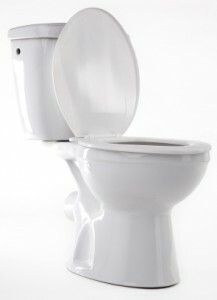 The Food and Drug Administration (FDA) has an approved list of medications that can be flushed to prevent drug abuse. A really great way to get rid of your expired or unwanted medications is through the use of the National Take Back Initiative, which is right around the corner! 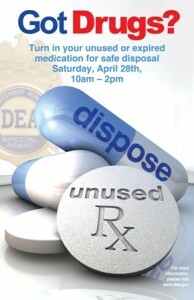 National Take-Back Program Saturday, April 28, 2012, from 10am-2pm. This one day event is a great way to dispose of expired, unused, or unwanted medications both prescription and over the counter medications. This is the fourth event in which the Drug Enforcement Administration (DEA) has teamed up with state and local law enforcements to help the local communities properly dispose of unwanted medications. What can you bring to National Take Back Day? Click here to find a medication disposal location near you! PLEASE tell your friends, family, and community about this event. For more information about the “National Take-Back Initiative” click here. And for local year-round disposal information/locations, please click here. Be sure to visit the Illinois Poison website for more tips on medication safety and our guidelines to proper medication disposal. And remember, the Illinois Poison Center is always available to help should you have questions regarding medication errors or experience a potential unwanted and or unexpected reaction to medicines, or other potentially harmful substances at 1-800-222-1222.